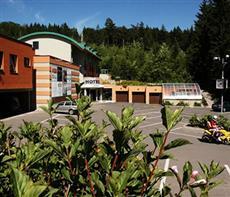 Travelers to Jablonec nad Nisou will love the Hotel Brizky. This lovely hotel in Czech Republic has a four star rating and is a great location to have an outdoor adventure holiday. There are fun actvities and sports all year long. In the summer, there is tennis, football, golf, walking, biking, and climbing. In the winter, you can go cross-country skiing or downhill skiing, or play a game of ice hockey. These can all be done very close to the hotel. You may also choose to go into the village, which has many charming buildings rich in history. When it comes to amenities, there is no end to them at the Hotel Brizky. There is a restaurant, which serves international cuisine. There is a bar if you care for a night cap. There are two conference rooms for any business purposes you may have. There is a garden and barbecue facilities if you wish to spend an enjoyable afternoon outdoors. There is even a sports center, where guests can play tennis, squash, or badminton, work out in the fitness room, practice their game at the indoor driving range, or relax in the wellness center, which offers a sauna, a Jacuzzi, and massage services. This is a great place for a sport enthusiast to take a holiday.